This option allows you to run a pre-prepared script. 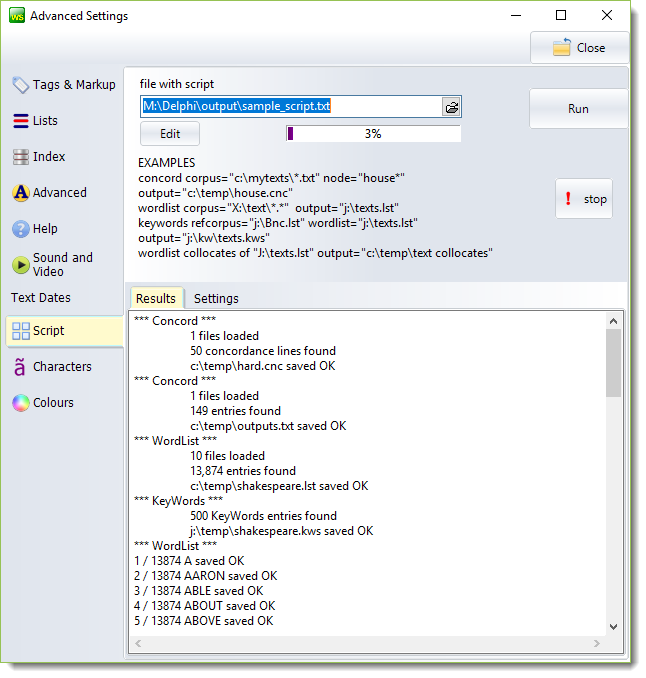 In the case below, sample_script.txt has requested two concordance operations, a word list, and a keywords analysis. It's done 3% of a further WordList job. The whole process happened without any intervention from the user, using the defaults in operation. The syntax is as suggested in the EXAMPLES visible above. (There is a sample_script.txt file in your Documents\wsmith7 folder). First the tool required, then the necessary parameters, each surrounded by double quotes, in any order. Not case sensitive. Each command must be on one line. 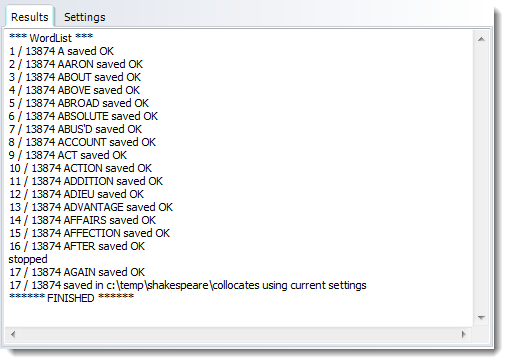 concord corpus="x:\text\dickens\hard_times.txt" node="c:\temp\sws.txt" output="c:\temp\outputs.txt" 1_at_a_time="true"
made a word list of all the .txt text files in a folder of Shakespeare tragedies (not including sub-folders) and saved it in its default format. made a key words list of that word list compared with a BNC word list and saved it. wordlist-index corpus="x:\text\shakes\oll\txt\tragedies\*.txt" clusters = "3" output="c:\temp\shakespeare_tragedies_3s.lst" excluded_subfolders="*_characters" include_subfolders="true"
Saves the output instead, as a txt, .xlsx, .rtf, or .xml file for use with other software. RTF_format is slower than the others. If 1_at_a_time is true, a word-list will export separate results text file by text file. The output needs to be a folder, not a file-name. 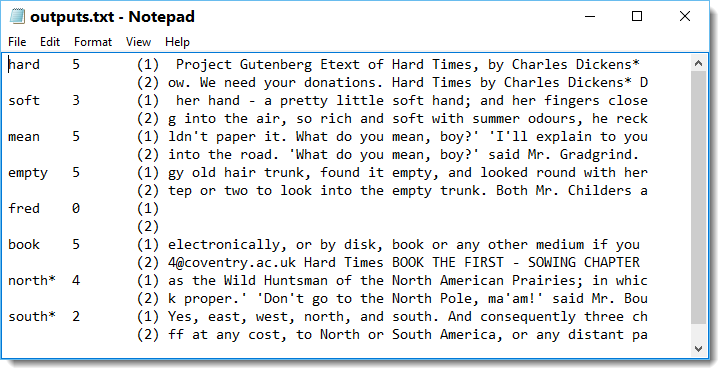 concord corpus="x:\text\dickens\hard_times.txt" node="c:\temp\sws.txt" output="c:\temp\outputs.txt" 1_at_a_time="true" fetch="5" show="2"
fetch tells WordSmith how many concordance lines to find, show tells it how many to show as a sample. wordlist collocates of "c:\temp\shakespeare.lst" output="c:\temp\shakespeare\collocates"
tells WordSmith to compute the collocates of each word in the shakespeare.lst word-list, and save results as plain text files, one per word, in the c:\temp\shakespeare\collocates folder. The texts to be processed are the same text files used when the word list was created (and must still be present on disk to work, of course). Settings affecting the process are shown below. The first 6 have to do with the words from the word-list, and the min. 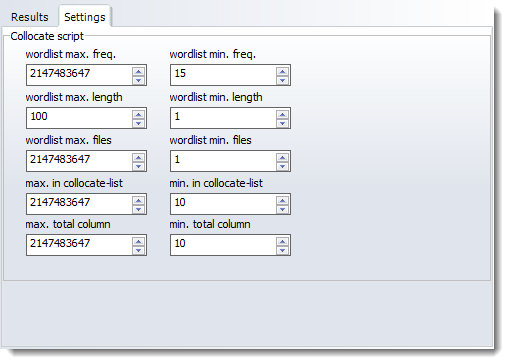 in collocate-list refers to how many collocates of each word-list word are needed (here 10) for processing to be reported. Min. total column refers to the number in the total column of a collocation display. Here they're incomplete because I pressed the Stop button. Each of these lists has the collocates output much as in a collocates display, but with the relationships also computed. The process only saves results where the settings shown above are met and where the relationships also meet the requirements as in the WSConcgram settings.